GOP Health Plan: 5 Things To Watch As The Bill Moves To The Senate : Shots - Health News Just three "no" votes by Senate Republicans would likely be enough to sink the GOP health bill. Democrats who lost the battle in the House are still convinced they can win the political war. 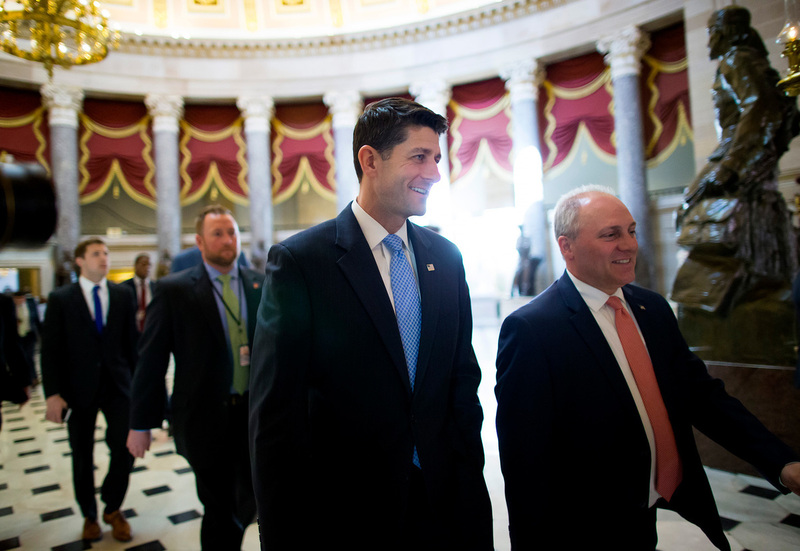 House Speaker Paul Ryan (center) walks to the House chamber ahead of a budget vote on Capitol Hill. Though Ryan was able to deliver 217 votes Thursday to get his GOP health plan through the House, there are still significant hurdles before the bill becomes law. After weeks of will-they-or-won't-they tensions, the House managed to pass its GOP replacement for the Affordable Care Act on Thursday by a razor-thin margin. The vote was 217-213. Democrats who lost the battle are still convinced they may win the political war. As the Republicans reached a majority for the bill, Democrats on the House floor began chanting, "Na, na, na, na ... hey, hey, hey ... goodbye." They say Republicans could lose their seats for supporting a bill that could cause so much disruption in voters' health care. Now the bill — and the multitude of questions surrounding it — moves across the Capitol to the Senate. And the job doesn't get any easier. With only a two-vote Republican majority and likely no Democratic support, it would take only three GOP "no" votes to sink the bill. Democrats have made clear they will unanimously oppose the bill. "Trumpcare is just a breathtakingly irresponsible piece of legislation that would endanger the health of tens of millions of Americans and break the bank for millions more," said Senate Minority Leader Chuck Schumer, D-N.Y.
MEDICAID: The House-passed measure makes the most sweeping changes to the program since its inception in 1965. Some of these changes, such as capping federal funding, would provoke intraparty divisions. UNINSURED RATES: The Congressional Budget Office initially estimated that the House bill would mean the loss of coverage for 24 million people. Many analysts say this number is now likely higher. TAX CREDITS: Some GOP senators are already on record opposing the bill's age-based tax credits, charging that they will make coverage unaffordable for older constituents. Others, however, describe these credits as "Obamacare Lite." PLANNED PARENTHOOD FUNDING: The House would defund this reproductive health organization for a year — a step that draws opposition from a handful of Senate Republicans. And Republicans in the Senate have their own internal disagreements, too. Here are five of the biggest flashpoints that could make trouble for the bill in the Senate. House leaders correctly point out that their bill represents the biggest changes to the federal-state health program for the poor since its inception in 1965 — a point that appeared to be drowned out during the most recent House debate that focused on coverage for people with pre-existing health conditions. For the first time, federal funding for low-income people on Medicaid would be limited, resulting in what House Speaker Paul Ryan, R-Wis., described at an event sponsored by the conservative National Review as "sending it back to the states, capping its growth rates." It's a longtime goal for many conservatives. "We've been dreaming of this since I've been around," Ryan said. But it is not a consensus position in the party. Some moderates support the current program, especially for children and people with disabilities. In addition, many GOP governors took the federal government's offer in the ACA of near-complete federal funding to expand Medicaid to nondisabled, working-age adults, and they are worried about the impact on their residents and their budgets if the expansion goes away and the program's funding is restricted. The House bill, wrote the Republican governors of Ohio, Michigan, Arkansas and Nevada in a letter to House and Senate leaders, "provides almost no new flexibility for states, does not ensure the resources necessary to make sure no one is left out, and shifts significant new costs to states." That pushback has also created doubts in the minds of some GOP senators. Rob Portman, R-Ohio; Bill Cassidy, R-La. ; and Shelley Moore Capito, R-W.Va., are among those who have expressed concerns about the House bill, as has Dean Heller, R-Nev., It's not clear whether any of the House changes have satisfied those senators. The Congressional Budget Office's initial estimate that the bill could lead to 24 million more Americans without health insurance within a decade spooked many Senate lawmakers. "You can't sugarcoat it," Cassidy told Fox News when explaining that "it's an awful score." The final House bill passed without the score being updated, although most outside analysts said the changes were likely to increase the number who would lose insurance. And Democrats have been using those initial numbers to score rhetorical points, even if they lack the votes in either the House or the Senate to stop the bill or change it. "The CBO's estimate makes clear that Trumpcare will cause serious harm to millions of American families," said Schumer. "Tens of millions will lose their coverage, and millions more, particularly seniors, will have to pay more for health care." On one hand, even with the additional $85 billion added by House leaders to help older people pay for their insurance premiums, many moderates feel the age-based tax credits in the bill replacing those in the Affordable Care Act are too small, particularly for people in their 50s and early 60s. The CBO estimated that under the original version of the House bill, premiums for a 64-year-old with an income of $26,000 a year could rise from $1,700 currently to more than $14,000. That brought a strong rebuke from the powerful AARP, which was an outspoken ACA supporter. "Although no one believes the current health care system is perfect, this harmful legislation would make health care less secure and less affordable," said a statement from the group. Sen. Susan Collins, R-Maine, has said she could not support the House bill in its original form because of concerns about the effects on older constituents. On the other hand, some conservatives in the Senate are ideologically opposed to offering any tax credits. Ted Cruz, R-Texas; Mike Lee, R-Utah; and Rand Paul, R-Ky., have all expressed concerns about the bill being too much like the ACA, with Paul referring to it as "Obamacare Lite." They worry that the tax credits amount to a new entitlement. "For me, it's a big stumbling block still that there's taxpayer money that's being given to insurance companies," Paul told reporters in late April. "And I'm just not in favor of taxpayer money going to insurance companies." As Republicans have been vowing for years, the House-passed bill would defund Planned Parenthood, although only for a year. That's likely because a permanent defunding would actually cost the federal government more money, according to the CBO, as some women who lose access to birth control would become pregnant, have babies and qualify for Medicaid. Birth control is vastly cheaper than health care for mothers and babies. But while cutting funding for Planned Parenthood is overwhelmingly popular in the House, there are a handful of GOP senators, including Collins and Lisa Murkowski, R-Alaska, who have said they are likely to oppose a bill carrying this provision. The budget process Republicans are using to avoid a Democratic filibuster in the Senate, called reconciliation, has very strict rules that require every piece of the bill to be directly related to the federal budget. It will be up to the Senate parliamentarian, a Republican appointee, to make those determinations. That's why the bill does not wipe away all the ACA's private insurance regulations, including the requirement that insurers not discriminate against customers who have pre-existing health conditions. Some analysts have suggested that the House amendment sought by conservatives to allow states to waive some of the health law's regulations might run afoul of the Senate's "Byrd Rule," which limits what can be included in a budget reconciliation measure. "It could be argued that any budgetary effects of the waiver are 'merely incidental,' " said the Committee for a Responsible Federal Budget in a blog post. Even Rep. Mark Meadows, R-N.C., who negotiated that amendment that won the backing of conservatives, conceded that it could prove problematic in the Senate. "There's still a lot of work that needs to be done before we can celebrate and all go home," he said in an interview outside the House chamber. Democrats say it is one of several provisions in the House bill that might not pass parliamentary muster in the Senate. For example, analysts have suggested that the GOP replacement for the much disliked "individual mandate" requiring most people to have insurance or pay a fine might not pass Byrd Rule scrutiny either. That's because the 30 percent premium penalty that people with a lapse in insurance would have to pay under the bill would go to the insurance company, not the federal government, so it would have no budget impact. A third potentially problematic element of the original House bill would allow insurers to charge older adults five times more in premiums than younger adults — up from a ratio of 3 to 1 under the Affordable Care Act. That provision could be viewed as not directly affecting federal spending, some analysts predict.